A woman wakes from a car crash inside an underground bunker with two men claiming an attack has devastated the outside world. Following an argument, Michelle leaves her fiancé Ben and drives away. Michelle’s car collides with another vehicle and she is knocked unconscious from the violent crash. Michelle wakes to find herself chained in an underground bunker with cement walls. Michelle attempts to escape and attack her presumed captor Howard, but Howard claims he is trying to save Michelle’s life. Howard explains that he rescued Michelle from the crash and took her to his doomsday shelter after some sort of attack made the outside world unsafe. Michelle meets farmhand Emmett, who helped Howard construct the shelter and is the only other person inside it with them. Emmett corroborates Howard’s claims about an attack of unknown origin contaminating the air outside. Michelle suspects Howard intentionally ran her off the road in an effort to abduct her. Michelle steals Howard’s keys and tries to escape. When she makes it to the airlock door, another woman appears outside the window frantically asking to be let in. Howard pleads with Michelle to not open the door, pointing out the chemical burns on the woman’s face as evidence of biological contamination. The woman dies. Howard tells Michelle that the woman was his neighbor Leslie, who knew about his shelter. He also confesses that Michelle’s car crash was his fault. Supposedly it was an accident and Howard inadvertently hit her while speeding to his shelter after hearing news of the attack. Days pass in the shelter with Michelle, Howard, and Emmett living as normally as possible. When helicopters are seemingly heard thundering overhead, Howard claims that based on his Navy experience, the aircraft do not belong to the U.S. military. Howard theorizes that the aircraft may be extraterrestrial. As the only person slim enough, Michelle has to enter the ventilation ducts and reset the air filtration unit when it becomes blocked. There, Michelle discovers a ladder leading to another hatch. Outside, she can see a clear sky. Inside, she sees that someone scrawled the word “help” on the hatch window. Michelle finds a bloody earring that she shows to Emmett. She also shows Emmett a picture of a girl Howard claimed was his daughter Megan. Emmett says that the girl is someone local who went missing two years earlier. Michelle and Emmett come to suspect Howard lied about his family leaving for Chicago, believing instead that he abducted and killed the young woman he claimed was his daughter. Emmett helps Michelle construct a makeshift hazmat suit and breathing mask in secret. When Howard discovers that someone used his scissors and duct tape, he threatens Michelle and Emmett for answers over a barrel of acid. To protect Michelle, Emmett claims he was constructing a weapon that he intended to use to take Howard’s gun. Howard unexpectedly shoots Emmett. Howard finds Michelle’s suit and a physical confrontation ensues. Michelle overturns the acid barrel, horribly disfiguring Howard while starting an electrical fire. Michelle dons the suit and escapes the shelter as it erupts in flames with Howard trapped inside. Seeing and hearing birds upon making it outside, Michelle removes her mask and realizes she can breathe normally. In the distance, she spies an unidentified aircraft. The shelter explodes in a ball of fire, attracting the craft’s attention. Michelle ends up pursued by a large alien creature and a biomechanical aircraft. Michelle destroys the creature/craft using a Molotov cocktail. Michelle flees in a car. She hears a radio broadcast identifying other survivors making their way to Houston and changes course. Another alien spaceship is seen in the sky over the distant horizon. Michelle needs a head-clearing getaway after a blow-up with fiancé Ben (Bradley Cooper’s voice making a disembodied cameo) prompts her hands to take the wheel and her foot to floor the gas. What Michelle receives instead is a shower of shattered glass and a cacophony of crunching metal as a sideswipe collision violently knocks her unconscious. When she wakes, Michelle finds herself recuperating not in a hospital bed or a loved one’s home. Her injured leg is shackled and the windowless walls surrounding on all sides are made of cement. This is not the change of scenery Michelle had in mind. This is the underground bunker of a doomsday prepper convinced the world has come to an end. Howard explains he isn’t Michelle’s captor. He is her savior. During her blackout, an attack of unknown origin supposedly devastated the country. Chemical, nuclear, foreign invaders or even extraterrestrials, Howard doesn’t know the details. What he is sure of is that the outside air is contaminated, everyone is dead, and the only safe place is beneath the earth with him. Michelle thinks Howard’s mind might be one conspiracy theory short of a complete crack-up. His claims are too wild to take seriously. Then Michelle meets fellow shelter resident Emmett, and he seems to corroborate everything Howard says. Unsure of what to believe or who to trust, Michelle has just become the third stranded survivor in one of the strangest post-apocalyptic scenarios imaginable. A scenario in which Michelle cannot even be certain if there ever was an apocalypse at all. Paranoia thrillers thrive on “who is telling the truth?” tension. The hard sell for any movie of this nature, particularly one bearing “Cloverfield” branding, is convincing an audience that the seemingly crazy character’s outlandish belief could be anything other than dead on the money. When it comes to such science-fiction and horror story setups, anyone screaming “you have to believe me!” is always telling the truth, no matter how outrageous the claim. Yet whether or not the outside world is an inhabitable wasteland is not this movie’s mystery. 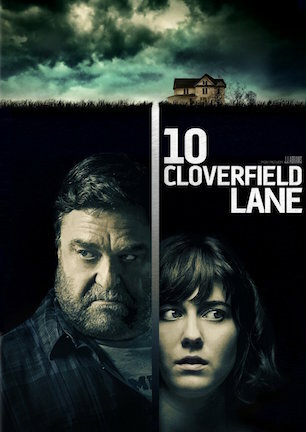 “10 Cloverfield Lane” sidesteps this traditional trap by never asking the viewer to truly consider the possibility that Howard could be completely wrong. Of course he isn’t. Instead, the film ensures that even Howard himself doesn’t know the exact nature of the threat lurking outside. He only knows there is one. “10 Cloverfield Lane” thus derives its tension not from a true/false question of “if” something is on the other side of the bunker door, but from anxious anticipation over “what” that something might be. We want Michelle to open the door as desperately as she does and know she eventually will. A second layer to the air of unease comes from wondering, and then gradually discovering, what route Michelle will take to finally turn the hatch handle. With two tiers of tension consistently prodding the claustrophobic character study at the center, “10 Cloverfield Lane” seethes with the kind of suspense that can curl fingers into claws embedding nails into seat cushions. All three primary players are brilliant casting choices. Those familiar with Mary Elizabeth Winstead have seen her in roles ranging from Scott Pilgrim’s ex-girlfriend and Abraham Lincoln’s wife to a “Final Destination 3” victim and a manipulative member of the “Faults” cult (review here). John Gallagher Jr. has gone from mild-mannered “The Newsroom” producer to masked maniac in “Hush” (review here). John Goodman has similarly appeared onscreen as jubilantly jovial, overbearingly empowered, and everything in between. What comes from all of the associations above is the knowledge that Winstead, Gallagher, and Goodman are as adept at playing clever and cunning characters as well as comedic ones. Put three more easily pigeonholed actors in their parts and you immediately know who is who. With Winstead, Gallagher, and Goodman, all personality possibilities are in play. Inherent uncertainty about everyone’s true identities is one more sleeved ace maintaining the mystery’s momentum. “10 Cloverfield Lane” isn’t overlong, even at one hour and 40 minutes. However, it is hard not to imagine that the plot would play better at half the length, in the vein of an “Outer Limits” or “Twilight Zone” TV episode. Production value has feature film scope, though the script sometimes stretches to make its core concept appear bigger than it needs to be. Pacing becomes a casualty of padding when the middle of the movie slows for each person to deliver a mini-bio monologue. “10 Cloverfield Lane” is about its characters and needs/wants to fully flesh their individual development. But such introspective moments rarely land as essential to explaining later motivations. Cut out more quiet time and a leaner film would hit with a greater wallop. Which is not to say “10 Cloverfield Lane” doesn’t pack a punch. It does. Argue if you must about a larger connection to “Cloverfield” and what that might mean for this movie. Research rumors about retrofitting “Valencia” or “The Cellar” to shoehorn that connection if you wish. Whatever the connection is, and no matter what the movie is called, “10 Cloverfield Lane” is still engaging, impressively acted, and a successfully strong sci-fi suspense thriller. April 8, 2016 by Ian Sedensky.